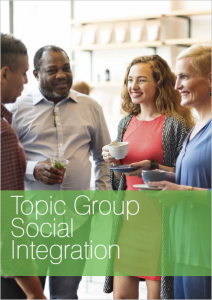 The Social Integration Topic Group aims at exploring how social housing providers can further promote and foster social integration by harnessing their asset platform and build on their trusted community partnerships to support and assist some of our most vulnerable residents including refugees. Social integration in the housing sector is about enabling different groups to have equal opportunities to access good quality accommodation that provides the right conditions for participation in the community, and which seeks to build communities where people from different backgrounds get along well together. It is about acceptance; an understanding of each other and our ways of living, being and thinking. Housing and working are a central part of people’s lives: they are like a platform from which we go out to meet the world. In particular, it is important to work on promoting social integration in the housing sector, both from a social and business perspective. The aim of the Social Integration Topic group is to address issues concerning the social integration of disadvantaged groups, incuding migrants and refugees, and all issues around poverty. Boost local economies by promoting employment and education with focus on tenants.